Over the past few years, Business Development Companies (BDCs) have proven very popular with yield-starved income investors. Given their sky-high yields, this is understandable. But it’s important for dividend investors to realize that this isn’t a “set it and forget it” industry, which means that successful long-term investing in BDCs requires being very selective about who you entrust with your hard earned money. Read on to find out just why these specialty finance stocks offer such juicy yields, but more importantly: who should invest in BDCs, what metrics matter the most to protect your capital, and what risks dividend investors need to be aware of. BDCs trace their origin to the 1980 Small Business Incentive Act, which amended the 1940 Investment Company Act; itself an answer to the 1929 stock market crash that heralded the Great Depression. While the Investment Company Act resulted in much needed changes to the transparency of investment firms, the rise of BDCs was because Congress recognized the need for private capital to raise funds more easily from regular investors in order to serve the vast middle market loan market. The middle market loan market consists of about 200,000 private businesses in the U.S. that make up roughly 33% of GDP. These are small companies, generally non-investment grade, and so large banks are less likely to lend them growth capital. This is especially true since the financial crisis, thanks to the passage of far stricter banking regulations such as Dodd-Frank, and Basel III. These laws require banks to hold more, higher quality assets on their balance sheets to ensure that another economic downturn or financial crisis won’t threaten the global financial system. BDCs help fill the gap by providing debt and equity financing to middle market companies. A BDC is technically a Regulated Investment Company (RIC), which is a closed end investment fund (meaning investors can’t withdraw money from the fund like they can a mutual fund) structured similarly to a Real Estate Investment Trust (REIT). Specifically, the BDC can avoid paying corporate taxes if it distributes 90% of taxable income in the form of dividends. Because of this requirement BDCs, like REITs or Master Limited Partnerships (MLPs), retain very little earnings and require raising external capital from debt and equity markets in order to grow. In addition, thanks to their beneficial tax status, BDCs are limited by law to holding at least 70% of assets in private U.S. companies. Their debt/equity ratio (leverage) was also limited to 1.0, meaning $1 in debt for every $1 in assets. However, the $1.3 trillion spending bill passed by President Trump increased BDCs' maximum leverage leverage (debt/equity) to 2:1, allowing them to provide more growth capital to small and mid-sized businesses and pursue higher quality deals. BDCs come in many different varieties, including which industries they specialize in, as well as what types of loans they make. For example, Hercules Technology Growth Capital (HTGC) specializes in technology companies, while PennantPark Floating Rate Capital (PFLT) deals exclusively in floating rate loans, which rise when interest rates do. However, arguably the most important distinction that a potential BDC investor must make is between internally and externally managed BDCs. This is because externally managed BDCs (the majority of the industry) have higher cost structures because the management team doesn’t actually work for the company. Rather, management is provided by an external financial company, one that usually specializes in large scale mid-market lending and is paid a hybrid fee structure consisting of a base rate (usually 1-2% of gross assets) and a performance fee. The performance fee is usually 20% of net asset value (NAV) growth above a predetermined fixed hurdle rate. In addition to a higher cost structure, there are two main downsides of externally managed BDCs. First, management doesn’t actually have to disclose its compensation information. For example, John F. Barry III, CEO of Prospect Capital Management, the manager of BDC Prospect Capital Corporation (PSEC), was reported by insiders to be making $100 million annually over the past few years, as part of management’s overall pay of $247 million in 2015, or approximately 31% of total revenue. This leads to the second potential risk with externally managed BDCs, potential conflicts of interest. Specifically, management can guarantee itself a higher payday as long as it grows gross assets, which can be defined in a variety of ways. For example, Prospect Capital (which is an example of bad BDCs to avoid) includes debt and cash that’s not yet invested in its asset calculations. In other words, management is free to sell as many new shares as it wants, as well as take on extra debt, to grow its fees, even if the resulting shareholder dilution destroys investor value over time. This has been what Prospect has done for years, with the resulting massive shareholder dilution and excessive management fees resulting in decline shareholder value (NAV) and a series of dividend cuts that have caused shares to decline over time (PSEC trailed the market by nearly 9% per year from 2011 through 2015). Or to put it another way, Prospect, as well as some other externally managed BDCs, can be run more like a publicly traded hedge fund, for the enrichment of management first, and investors second. 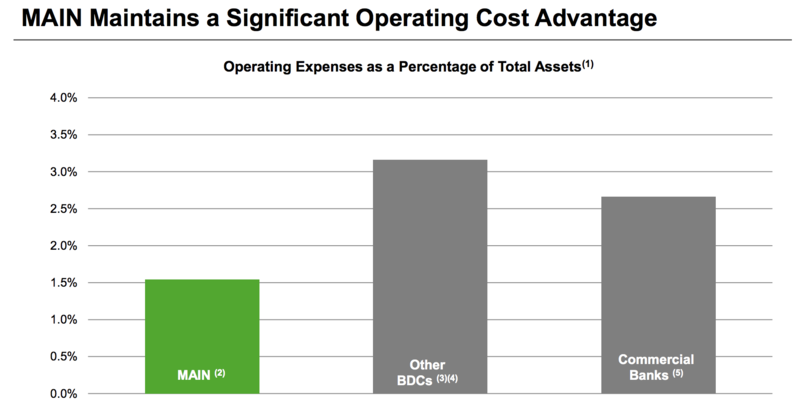 In contrast, internally managed BDCs such as Main Street Capital (MAIN), Triangle Capital (TCAP), and KCAP Financial (KCAP) generally have lower costs due to a lack of external management fees, as well as compensation incentives that are better aligned with shareholders because usually they are based on growth in NAV per share. This means that management can’t get a raise unless it is consistently creating shareholder value, which often comes in the form of growing dividends. Better yet, because internally managed BDCs don’t pay their executives as a percentage of assets, internally managed BDCs can achieve better economies of scale as they grow. This means that earnings per share grow, making the dividend more secure and capable of better long-term growth. So obviously the secret to BDC investing is just to stick with internally managed ones, right? Not necessarily, because as with most things in the world of investing, there are few black and white absolutes. There are actually several good reasons that one might choose to own an externally managed BDC. For example, take a look at one of the largest BDCs, Ares Capital Corp (ARCC). Ares Capital is managed by Ares Capital Management, one of the world’s largest specialty finance companies with over $90 billion in asset under management and operations across the globe. This gives Ares Capital access to potential customers and deals that smaller, internally managed BDCs without major sponsors like Ares couldn’t hope to do. In addition, not all externally managed BDCs are run by shareholder unfriendly management teams. For example, some have much lower base management fees of just 1% and exclude things like cash and credit revolvers from their gross asset calculations. As you can see in the 2016 list of business development companies below, the cost structure for externally managed BDCs varies widely, with some of the larger externally managed ones able to leverage economies of scale into lower expense ratios than even some internally managed BDCs. So if one can’t simply use a rule of thumb for BDC investing, how does one go about navigating this often confusing and high risk world of big yields, built upon a tower of subprime lending and investments? The answer requires us to first understand the key risks involved with the BDC industry, followed by a look at its most important metrics. Globally speaking, interest rates remain near their lowest level in history, which explains the immense interest in higher-yielding dividend stocks like BDCs. But you always need to remember that Wall Street isn’t a charity, and no one is going to offer you such mouthwatering income returns without a lot of risk in most cases. In the case of BDCs, the cash flow supporting the dividend mainly consists of high interest loans to companies that other banks won’t touch. In other words, these are higher risk, subprime borrowers who have no better alternative for financing their businesses. Now, that doesn’t mean that all BDC loans are created equal. Just like with bonds, there are different types of loans, of varying quality, with higher risk generally corresponding with higher interest rates. This brings me to the major risks associated with this industry and why it’s vital to be very selective when investing in this industry. For example, higher cost BDCs (usually the externally managed ones, like Prospect Capital) have to reach more for yield in order to be able to cover their dividends. This means lending to riskier, often distressed companies, including in out of favor industries such as those in the oil & gas sector. In addition, some of these loans are riskier than others because unlike the highest quality bonds, they are unsecured, meaning no collateral backing them up. So in the event that the company defaults on its loan the BDC can end up taking a big loss, which shows up as a decline in NAV/share, the equivalent to the book value per share of a bank. Since share price generally tracks NAV/share over time, a decline in NAV caused by defaults and loan write-offs means a lower share price and a harder time for the company to raise equity capital at high enough prices (i.e. a low enough cost of equity) to grow NAV/share over time. Or to put it another way, BDCs, because their investment capital comes so much from equity markets, are at the mercy of fickle investor sentiment. If share prices fall too low because management made too many speculative loans that are now defaulting (and forcing dividend cuts), the share price can fall low enough to trap the BDC in a downward spiral of declining NAV, ongoing dividend cuts, and an endless downward spiral in share price that results in permanent destruction of investor capital. Part of the problem which brings up another important risk is that like most specialty finances industries, there are very low barriers to entry. Basically, in today’s world, which is awash in almost free money, anyone can set up a BDC and compete for customers. Which means that, as interest rates have stayed low for so long, net interest margins, or the difference between the cost of borrowing and the interest rate at which BDCs can make loans, has steadily declined. This has only made the higher cost BDCs more desperate and forced to go out further on the yield/risk curve, making steadily riskier loans. Of course, when economic conditions or specific industries get hit hard, such as with oil companies in this era of low energy prices, this can result in higher default rates, which hurt Prospect Capital in 2015. As this chart of Prospect Capital’s dividend shows, the BDC industry, like banking, is cyclical, tracking economic health. No one can forecast macro conditions with any real consistency, but recessions are not good for BDCs. Unfortunately, since many BDCs went public after the financial crisis, thanks to zero interest rates making their high-yields more attractive, investors seeking a track record that spans various economic and interest rate conditions don’t have many options, other than Main Street Capital, Ares Capital Corp, and Triangle Capital, all of which are at least a decade old, with battle-tested management teams that survived the Great Recession. Note that Triangle Capital is both internally managed and generally considered one of the best managed BDCs in the industry. Yet even it has had to cut its dividend in 2016 and 2017 thanks to relatively high exposure to loan losses in the oil & gas industry. As for Main Street and Ares Capital, you’ll notice two things about their payout histories. First, they occasionally issue special dividends. This is because of the need for occasional “catch up” dividends. That happens when profits are so high that the regular dividend would result in the company going under the 90% regulatory income distribution. Since a loss of BDC status would result in heavy tax penalties, a catch up dividend is used to prevent this painful and shareholder value destroying event. But more importantly, even good BDCs can have variable payouts over time. This is a result of how the business model is structured for tax reasons. In other words, like mortgage REITs, BDCs are higher risk, higher-yield financial stocks, and with that comes higher volatility. This ultimately means that dividend investors need to use prudent risk management (i.e. only owning a few select BDCs and only as part of a well-diversified dividend portfolio). That’s assuming you want to own them at all. After all, if you are a retiree living off dividends and your primary goal is a secure, always rising income stream, then neither BDCs nor mREITs really meet your needs. Sure, they can be a small part of a larger portfolio, but their risks are very real. Of course, assuming your risk profile, time horizons, and goals allow for BDCs, how is an investor to determine what is a good one, such as Main Street Capital, and which are potentially “value traps” like Prospect Capital? Every industry has its key metrics to watch and with BDCs there are four that every potential or current BDC investor needs to know: weighted average portfolio yield, NAV/share, the non-accrual ratio, and the NII payout ratio. Portfolio yield is just the weighted average yield on the BDCs loans and other assets (which can include equity stakes in the companies they finance). 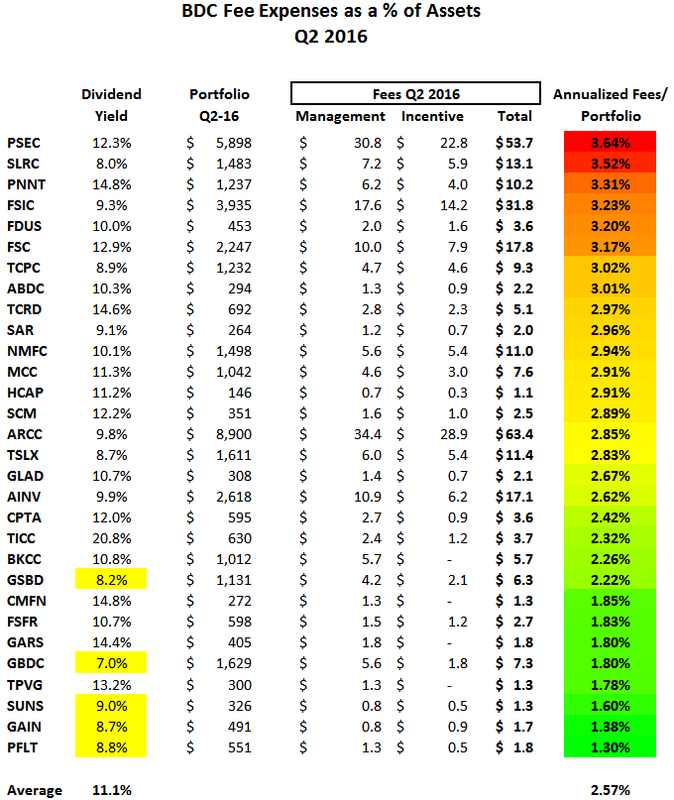 The weighted average portfolio yield can tell you two important things about a BDC. First, the yield can be a good proxy for how risky the BDC’s portfolio of loans is. Remember these are all subprime loans, so generally a lower yield is better because it means that the loan book is probably more heavily weighted towards first lien (i.e. more senior) debt. In the event of a default, that allows the BDC to recoup at least some of its investment. From Main Street Capital’s first-quarter 2018 results below, we can see two important facts. First, the firm's loan book remains conservative by the standards of the industry, where average portfolio yields can often be 13% to 15% (Main Street Capital’s yield is around 10.5%). Second, and perhaps more importantly, we can see that the portfolio yield is above the stock's dividend yield near 6%. This tells us that Main Street’s conservative portfolio can easily support the monthly regular dividend as well as the special dividends management pays, assuming interest payments continue to be made. Another metric investors need to check with any BDC is the trend in NAV/share. Remember that financial companies like BDCs and banks have an intrinsic value, which is the total value of all tangible assets minus liabilities. But because BDCs have rising share counts, thanks to a constant influx of new equity capital, we need to make sure that NAV or shareholder value per share is actually rising over time. This is the best way of telling whether a BDC is helmed by a skilled management team that can be trusted with your capital (and is not growing for the sake of growth). Growth in NAV/share will usually not be at more than a low to mid-single-digit annual pace. However, demanding a positive growth rate is one of the better filters for excluding those BDCs whose management teams have proven incapable of creating long-term shareholder value, such as Prospect Capital and Full Circle Capital. Another reason that NAV/share is such an important metric is because the premium or discount a BDC trades (Price-to-NAV) at is another great proxy for the quality of the management team. A BDC's price-to-NAV multiple generally ranges from 0.5 to 1.75. This metric is important for two reasons. First, a BDC that can’t invest accretively (i.e. increasing its NAV/share), either due to a poor management team, too high cost structure, or both, will destroy shareholder value by decreasing NAV/share over time. The market thus tends to price the highest quality, most successful BDCs at a premium to NAV/Share. While that may seem counter intuitive, to invest in BDCs that are trading at or above NAV/share (above 1.0), it is actually the conservative and smart approach to this high-risk industry in most cases. For example, look at Full Circle Capital, which destroyed over 50% of NAV/share (i.e. shareholder value) from 2011 through 2015. FULL’s stock returned negative 11.9% per year while the market gained 12.4% annually over this period. The market was offering Full Circle at a steep 25% discount to its intrinsic value (a price-to-NAV ratio of 0.75). But if you had done your homework and seen that Full Circle had a history of growing through excessive shareholder dilution, resulting in a collapsing NAV/share, a 50+% reduction in the dividend since 2011, and a substantial loss over that time, well you would hopefully think twice about investing in this toxic BDC. On the flip side, Main Street Capital trades at a large premium to NAV/share as investors price in the best management team in the industry, one of the least risky loan books, one of the most secure dividends, and the absolute best payout growth rate. While past success is no guarantee of future excellence, in the high-risk BDC industry it can be a helpful factor to evaluate. In addition, a premium valuation is also an actual competitive advantage to a BDC and can actually help “winners keep winning". Remember that BDCs are constantly selling equity to grow their assets, because they are legally limited to a debt/equity ratio of 2:1. 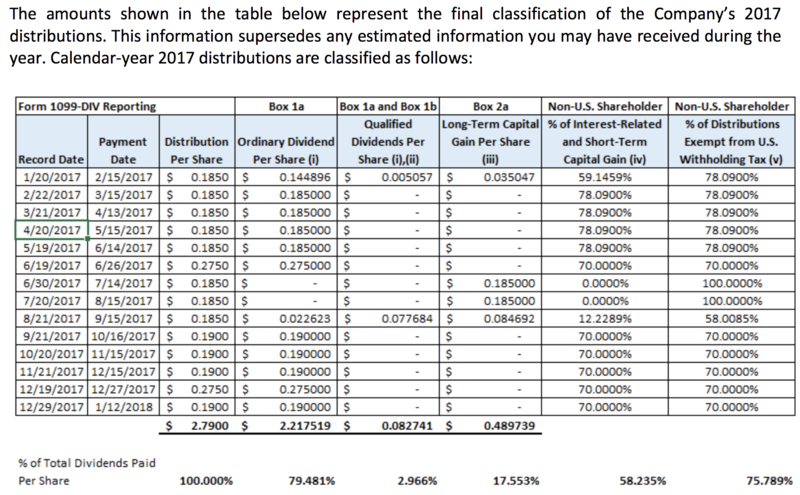 If a BDC is trading below its NAV/share, then every share sold is literally further destroying shareholder value because, as we saw with our Full Circle Capital example, it’s selling $1 in assets for $0.75. On the other hand, Main Street’s premier “brand” in the BDC industry allows it to sell new shares to raise growth capital at the rate of about $0.60 in assets per share for each $1 in additional equity raised. That extra $0.40 per share? That benefits existing investors because is accretive to NAV/share. Said another way, Main Street’s unbeatable track record as the best-managed BDC in America helps it to secure low costs of equity capital and keep growing its asset base, NII/share, and the dividend. That, in turn, leads to more earnings and a more secure, growing dividend, which in the long-term causes the share price to appreciate. The next metric that’s important for BDC investors to keep track of is the non-accruing loan ratio, which tells you how much of a company’s loans are in default. For the first quarter of 2018, Main Street had six loans on non-accrual status representing 0.8% of its total investment portfolio at fair value. This is a healthy level that should not put the dividend at risk. However, BDC investors should monitor a firm's non-accrual ratio because its changes can signal that the credit market may be turning, a potential prelude to a recession and trouble for the industry as a whole. Finally, and most importantly for all dividend investors, is the Net Investment Income (NII), which funds the dividend. Remember that BDCs are legally required to pay out almost all income as dividends, so any payout ratio under 100% can represent a sustainable payout. More importantly than the payout ratio in any given quarter is the trend over time. After all, a payout ratio above 100% for several quarters in a row is likely a sign of distress at the BDC and a potential prelude to a dividend cut. On the other hand, Main Street Capital's payout ratio has hovered near 90% in recent years, demonstrating the stability of its business. BDCs are essentially investment funds that generate income, qualified dividends, unqualified dividends, and sometimes returns of capital (giving shareholders their money back). 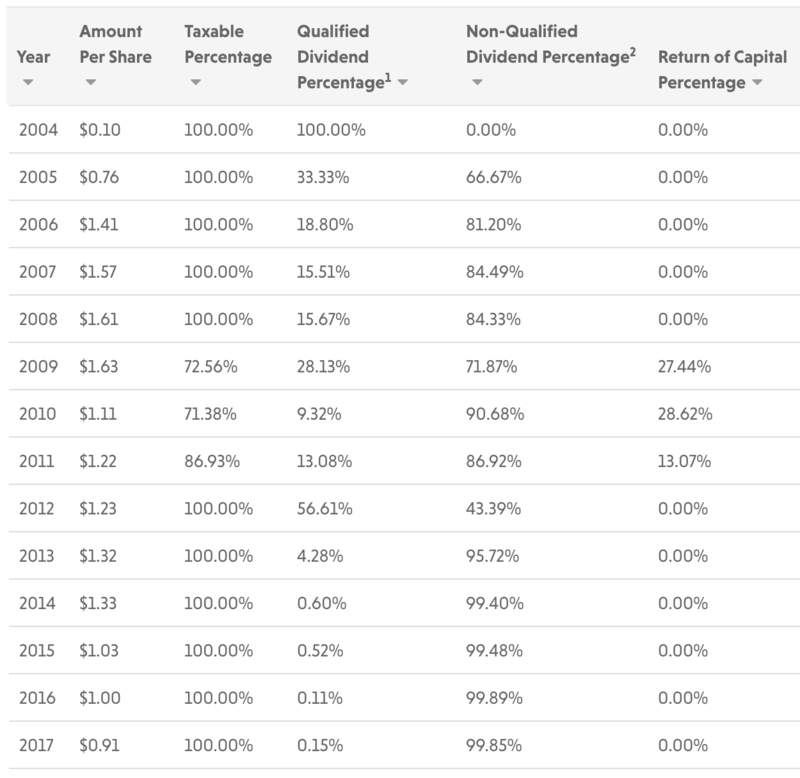 Every dividend will have a certain percentage of each kind of income (except for returns of capital which you never want to see). While the individual makeup of each BDC will vary and can change substantially from year to year, generally the largest percentage of the dividend is taxed as unqualified ordinary income. This is because Congress created BDCs to help fund small business growth and so structured them as pass-through entities, similar to REITs, which also pay unqualified dividends. The reason that some BDCs, such as Main Street Capital, have relatively high qualified proportions of their dividends is due to their larger equity stakes in the companies they finance, which generate qualified dividends and long-term capital gains. The importance of qualified versus unqualified dividends is that qualified dividends are taxed at either 0%, 15%, or 20% depending on your tax bracket, while unqualified dividends are taxed at your top marginal income tax rate (up to 37%). Want to avoid the tax headache entirely? Then owning BDCs inside tax sheltered or deferred accounts such as Roth IRAs, IRAs, and 401(k)s is a good way to do that. And unlike MLPs, which generate UBTI (unrelated business taxable income) that you have to report and pay taxes on if your annual UBTI is above $1,000, BDCs are safe to own in these kinds of accounts because they create no UBTI. However, if you choose to own BDCs in taxable accounts instead, then the first 20% of BDC dividends are now tax deductible through 2025 under the new pass-through deduction passed by Congress in late 2017. BDCs are high risk and are not for conservative income investors seeking steady and steadily rising dividends. They are complex, volatile, and, much like banks, own hard-to-decipher “black boxes” of various loans and financial assets that many investors simply don’t wish to bother with. BDCs generally fall outside of our circle of competence and don’t seem appropriate for the fairly concentrated dividend portfolios. However, as long as you understand what they are, the risks involved, and how to separate the best-of-breed BDCs from the toxic trash, select BDCs can make a reasonable, but small, contribution as part of a well-diversified dividend portfolio in search of yield.